Fall in the air and I LOVE IT!! Makes me want to get in the kitchen and bake up some goodness. 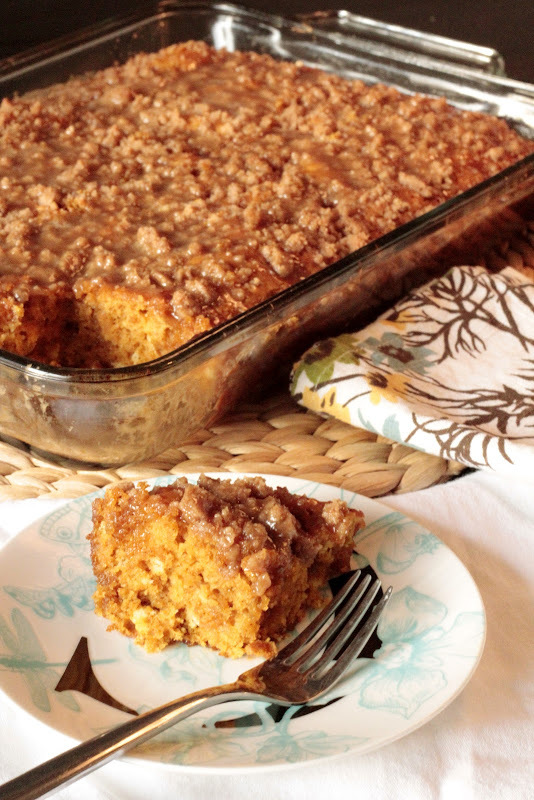 If you LOVE fall like I do then I have a recipe I want to share with you. I have not, I repeat, I have not tried this recipe... but I will SOON!! If someone makes it before I do PLEASE let me know how you enjoyed it. In a large bowl mix together the water, pumpkin, eggs, 1 Tablespoon of vanilla and pumpkin pie spice until well combined. Add the cake mix and baking soda and mix until just combined. Grease a 9×13 pan with butter and pour batter into pan. In a small bowl mix together 1/2 cup of brown sugar, 1/2 cup flour and melted butter. Use your fingers to sprinkle over the top of the cake. Bake at 350 for 25-30 minutes, or until a toothpick inserted comes out clean. For the glaze, combine the other 1/2 cup brown sugar, granulated sugar, 1 teaspoon vanilla, and heavy cream in a saucepan and bring to a simmer. Remove from heat and stir until all sugar is dissolved. When cake is finished baking, poke holes in the top with a toothpick. Pour glaze over the cake, making sure to cover all surfaces. Serve cake warm or at room temperature.